Joe Biden's tax return information 1998-2008. "Steve Jobs is a genius. He is an innovator. A visionary. He is perhaps the most beloved billionaire in the world. Surprisingly, there is one thing that Mr. Jobs is not, at least not yet: a prominent philanthropist. Despite accumulating an estimated $8.3 billion fortune through his holdings in Apple and a 7.4 percent stake in Disney, there is no public record of Mr. Jobs giving money to charity. But the lack of public philanthropy by Mr. Jobs — long whispered about, but rarely said aloud — raises some important questions about the way the public views business and business people at a time when some “millionaires and billionaires” are criticized for not giving back enough while others like Mr. Jobs are lionized." Sorkin does allow for some mystery and uncertainty by saying that "it is very possible that Mr. Jobs, who has always preferred to remain private, has donated money anonymously or has drafted a plan to give away his wealth upon his death." Another national figure whose charitable giving is not mysterious or uncertain is Vice-President Joe Biden, see his tax information above for the years 1998 to 2008 (source). Biden's AGI in every year exceeded $200,000 and his total income over the 11-year period totaled more than $2.7 million. How much did he give to charities? Only $5,575 during the entire period, averaging about $500 per year, and representing only 0.20% of his income. 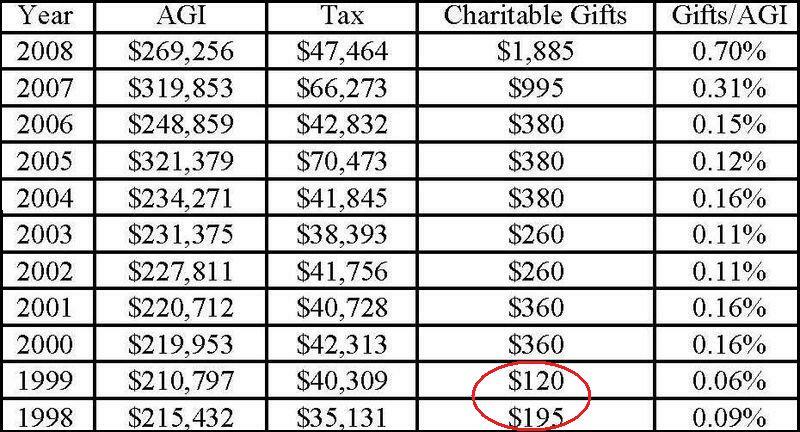 If you disregard his last two "generous" years leading up to the 2008 election, his charitable giving was only 0.1265% of his income, or about one-eighth of 1%. 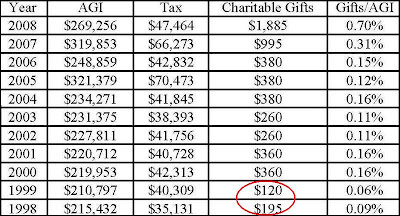 In 1999, Biden reported only $120 in charitable gifts for the year, which likely included his church giving. Had he been tithing to his church like many of his fellow Catholics, his charitable contributions should have been about three times that amount - every week. Of course, whether you're Steve Jobs or Joe Biden, you have the right to be as generous or as miserly as you want, and shouldn't be criticized for personal decisions about spending your own money. But it appears that Mr. Sorkin is holding business leaders like Steve Jobs to a higher standard for charitable giving than say, a political leader like the Vice-President. I'm pretty sure that neither Mr. Sorkin, nor any other NY Times columnist has probably ever questioned Mr. Biden's documented record of (un) charitable giving. And that's fine. But then they don't have the right to question Mr. Jobs's unknown record of philanthropy. After all, if successful business people have some obligation to "give back" to society, then don't successful politicians have that same obligation as well? I have more respect for people who aren't "prominent" philanthropists. Actually, I would prefer the Buffets, Gates and Jobs of the world keep creating and financing wealth-generating companies. Jeez, it seems like every wealthy person or Hollywood star sets up a charitable foundation, usually with wife or children in charge, and they sit around thinking grand thoughts. Maybe Andrew Carnegie (steel baron)had it right: Tax away everything at death. If Steve Jobs gives to charity, it is most certainly not a matter of "giving back." On the contrary, anything he gives would be giving MORE. In order for him to "give back" he would have to have taken something in the first place, which he has not. In fact, he has created enormous amounts of value for people all over the world in countless ways. The portion of that value represented by his financial assets is puny in comparison. Personally, I have used Mac computers since 1986 and owned about 20 different models during that time, spending at most a total of $50,000 on them. Of that $50K, Steve Jobs himself would have personally received no more than a couple of thousand, if that. Yet I have used those computers to generate millions of dollars in revenue over the years. Yes, charitable giving makes a very positive difference for a lot of people and organizations who receive the charity. But in the case of Steve Jobs and others like him who are skilled at creating massive amounts of value through commercial enterprises, the world is much better off when they plow their wealth back into productive, profit-making, job-creating businesses. The best thing you can do for the society as a whole is be good at your job. Also, maybe he gives to charity and doesn't write it off on his taxes because he is willing to pay to have a personal life? Or maybe a vast majority of his fortune is not liquid. Why do we care about any of this? I am a stockholder of Apple and I don't even care. Benji notes (wrongly) that Andrew Carnegie suggested taxing everything at death. No, Mr. Carnegie argued in a short essay, The Gospel of Wealth, that the rich should administer their own giving and not the government. "In bestowing charity the main consideration should be to help those that help themselves..."
Neither the individual nor the race is improved by alms-giving." This essay had a profound impact on Bill Gates, his dad and his wife. Thus, it is no coincidence that Gates and Carnegie will have endowed education iniatives. Amen, Ralph! Thank you for your excellent comment. I guess Biden believes only in spreading around the wealth of other people - just pompous lecturing from empty suits. "Even Andrew Carnegie testified in Congress in favor of an estate tax as the best way to address wealth concentration." "The greater part of this steel magnate’s little magnum opus, The Gospel of Wealth, is devoted to a discussion of the three possible ways to dispose of wealth: (1) leave it to the families of decedents, (2) bequeath it for public purposes, and (3) administer it during one’s life. Carnegie abhorred the first, tolerated the second, and encouraged the third." Carnegie basically thought you should give away all your money while alive, leaving none to the state or offspring. Thus he in fact supported the estate or death tax. I have to say, I do not favor taxing the first few million in estates. Family businesses make increasing sense in a world where a corporation will give you a pink slip if they can. So, start your own business, and maybe pass it on to your children. But having children run a foundation? Carnegie thought inherited wealth made for weaklings. Can you even names Gates' children, of Buffett's children? How about Milken's? Has any billionaire's offspring ever accomplished anything? I always tell my kids I never made much money so they would come out strong. Estate taxes are a boon for insurance industry. Small business owners have to buy big policies to pay estate taxes so they can pass the businesses down to their kids. Benji, Carnegie did not favor an estate tax and you prove it in your statements. Carnegie said that huge wealth was a burden for the children. Gates will make sure that his children are comfortable at about 5% of his wealth at this time. That is still a fortune. I think most of us are uncomfortable with great fortunes being handed down, so I salute Carnegie and Gates. "Yes, charitable giving makes a very positive difference for a lot of people and organizations who receive the charity. But in the case of Steve Jobs and others like him who are skilled at creating massive amounts of value through commercial enterprises, the world is much better off when they plow their wealth back into productive, profit-making, job-creating businesses." "I guess Biden believes only in spreading around the wealth of other people - just pompous lecturing from empty suits." Yes indeed! That's the Joe Biden I know. "Can you even names Gates' children, of Buffett's children? How about Milken's? Has any billionaire's offspring ever accomplished anything? " Well, Fred Trump's son has managed to become a clown, that must be worth something. Think what you want. The decision is yours, but my decision should be mine as well. That's the point. "I have to say, I do not favor taxing the first few million in estates." And how much is enough? Who should decide how much of someones private property their family should be allowed to keep, if it is their wish that the family keeps all of it? You? Remember, the estate has already been taxed once, as earnings. Your statist stripes are showing, bunny. Benji, who somehow fancies himself the 2nd coming of Milton Friedman, now calls for seizing other men's wealth at death. He even uses the common tactic of Leftist parasites by justifying it in the name of "the chilldren." "I could go on about this, but there is nothing I could say that hasn’t been better expressed by Dan Mitchell of the Cato Institute, and Mark Perry of the indispensable Carpe Diem. Enjoy!" "Benji, who somehow fancies himself the 2nd coming of Milton Friedman, now calls for seizing other men's wealth at death. He even uses the common tactic of Leftist parasites by justifying it in the name of "the chilldren." Yeah. We will make them suffer through life without the character destroying wealth their parents provided for them. It's interesting that the "VP of the redistribution Presidency." is a cheapskate. As is the case with Libs, it's do as I say, not as I do. Considering how much personal tax that Mr. Jobs must pay, then considering the amount of tax dollars that go toward welfare and subsidy for those who under-produce, I'd say that Mr. Jobs has given much to "charity." Those dollars are often overlooked because tax monies are not considered one's own; rather they are considered "state property." And that is a serious problem in governing philosophy. What one produces is his own and does not BELONG to the state. Why not let the heirs redistribute it themselves?